Army cadets from Chiswick’s 206 Detachment (Royal Signals) joined with Brentford cadets and over 400 others from around the UK for a special Music Camp week at Longmoor Camp in Surrey this October. 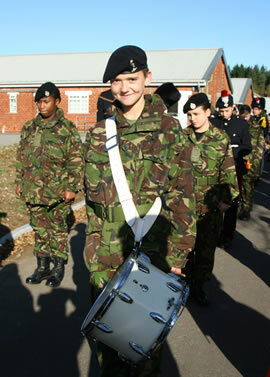 The bi-annual camp provided music training for young people from beginners up to Grade 8 and is part of the Army Cadet Force learning syllabus. During the week the bands gave a concert at a local care home and on the last night gave a grand concert in Southampton. While music has always been a part of London’s Army Cadet life, this is the first time that Middlesex and North West London Sector have taken part in the music camp, and signals a new opportunity for musical youth in the North and West London cadet area. By following a structured syllabus, cadets can now gain the BTEC First Diploma in Music, equivalent to four GCSEs at A*-C, additionally your music can count towards your Duke of Edinburgh’s Award. The Army Cadet Force is now looking for a suitable adult member to join its team in West London who is musical and can take the Corps of Drums forward. Military experience is not required. 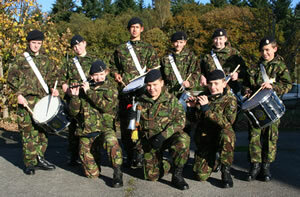 Musical and Army Cadet training will be provided. If you can commit to a Wednesday evening weekly please contact Staff Sgt Joe Lazell directly on 020 8568 6044 (Tuesdays and Thursdays 1900 to 2130 or leave a message) or info@203brentfordacf.co.uk. The Army Cadet Force (ACF) is the Army's national voluntary youth organisation with a membership of over 47,000 12 to 18 year old boys and girls. It operates in over 1700 locations all over the UK. Its aim is to inspire young people to achieve success in life, with a spirit of service to the Queen, Country and their local community alike. In Middlesex and North West London ACF there are 34 Detachments, with over 1000 cadets, which meet twice a week in locations all over the North West of London, from Barnet in the North to Victoria in the South and as far West as Staines. The cadets participate in a full range of activities which include sport, first aid, adventure training and community work, as well as military skills. The ACF are also major participants in the Duke of Edinburgh's Award. 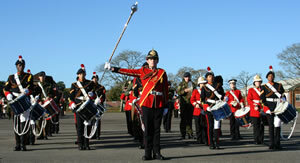 For more information visit www.armycadets.com or call 0845 600 77 99 for an information pack.